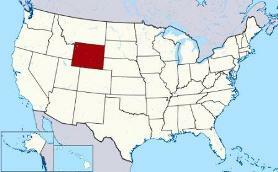 Where is the Capital of Wyoming? 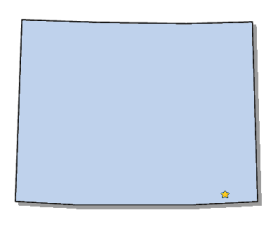 The Map of Wyoming (WY) shows the location of the state capital in the "Equality State". Wyoming has 23 counties, and the capital of the State is Cheyenne. On a map, the capital city is always indicated by a star. Interesting fun facts about Cheyenne including its history, location, county, current population, size of the city and the nickname of Cheyenne, Wyoming. The Map of Wyoming and map provides an outline of the state, which covers 97,818 square miles. The size of the state's capital city, Cheyenne, is 21.2 square miles. Test your recognition skills of the map of the state, and knowledge of its capital, with our State Maps Quiz Game. The location of Cheyenne is on Crow Creek, in the south eastern corner of the state. The city is located in Laramie county, Wyoming. Each of the 50 states have their own capital city. The city of Cheyenne is the capital of the state. The capital does not have to be the largest city in the state, but is usually centrally located either geographically or by population. Fact 3: The population of the capital city is 61,537. Nickname "The Magic City of the Plains"
Fact 4: It is the county seat of Laramie county. Fact 5 on History: Native Indian tribes were the early inhabitants of the area. The names of the Wyoming tribes included the Cheyenne, Comanche, Crow, Arapaho, Dakota, Kiowa, Pawnee, Shoshone and the Ute. Fact 6 on History: The site of the town was originally a campsite for Major General Grenville Mellen Dodge (1831 – 1916) and his US army troops, who in 1865 were ordered to search for a railroad route over the Laramie Mountains (then known as the Black Hills). Fact 8 on History: It was made territorial capital in 1869 and was given the nickname "Magic City of the Plains"
Fact 9 on History: Despite the romantic sounding name the early city was a real 'Wild West' town with its saloons, gambling and shoot outs. The number of people, or the population of the capital city of Cheyenne, obviously changes constantly but the government statistics for the 2012 population of Cheyenne was 61,537, which provides a good indication of the number of inhabitants of the city. We hope that the interesting facts and information about Cheyenne will help kids and school children with their homework. Learn more by playing the States and Capitals Game. Cheyenne Nickname "The Magic City of the Plains"